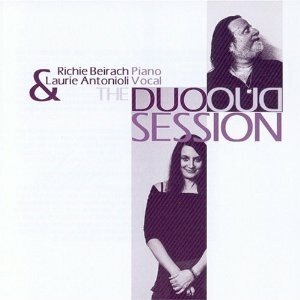 This critically acclaimed recording emerged from Antonioli’s long-running partnership with Richie Beirach, one of the most important figures in modern jazz piano. They perform a mix of Miles Davis jazz standards and Beirach’s compositions, with Antonioli’s haunting lyrics. Applause! – and then silence. Into the silence comes a few tones and then some impressive chords. Over this you hear a horn singing a melody. The horn speaks, and its message comes out clearly. And there is an orchestra with bright strings and dark basses. As it turns out the horn you hear is the voice of Laurie Antonioli and the orchestra is a piano played by Richie Beirach. It’s 8:30pm, December 18th, 2004 at the jazz club “Porgy & Bess” in Vienna, Austria and Beirach and Antonioli are performing a Duo Session. And when they play, it’s Beirach AND Antonioli. No one comes first; they work side-by-side, a union of ideas, spontaneity and intelligence. Both are so familiar with the material and with each other that they can go as far as their inspiration leads them, in trust, where they meet each other again and again at just the right moment. Laurie’s style of singing is unique. She’s a true “natural” musician and her lyrics to Beirach’s wonderful compositions like “Elm” and “Nightlake”, along with the Miles Davis classics “Blue in Green” and Miles’ trumpet solo on “Flamenco Sketches” show her instinctive talent to find text that fits perfectly to the melody. When she sings she bends the words, she whispers, she swings, she uses all the different timbres of the human voice to bring out the meaning of the lyrics. And Beirach plays with great passion. He is a master of harmony and colors, and has a sound you can identify right away. Aside from his harmonic and melodic virtuosity, his burning rhythmical approach is demonstrated with a left hand that is as strong as any rhythm section. He can change the direction of a piece from a gentle rubato ballad to an up tempo pace and still keep it light and flowing. Hearing these two musicians collaborate in a live performance is a very powerful experience. Now, in 2005 they fortunately decided to release this recording. This cd documents a great duo at work. It also shows how well known standards like “Green Dolphin Street” and “You Don’t Know What Love Is” can be made to sound new. Antonioli and Beirach have been in the music business for a long time and this is one stop on their musical journey. Enjoy. Silence! – and then applause. Be the first to review “The Duo Session” Click here to cancel reply.